What a sweet frog. Looks like he is ready to go a courtin’. Wonderful sketch artista Laura! Thanks, Kerfe! They do. 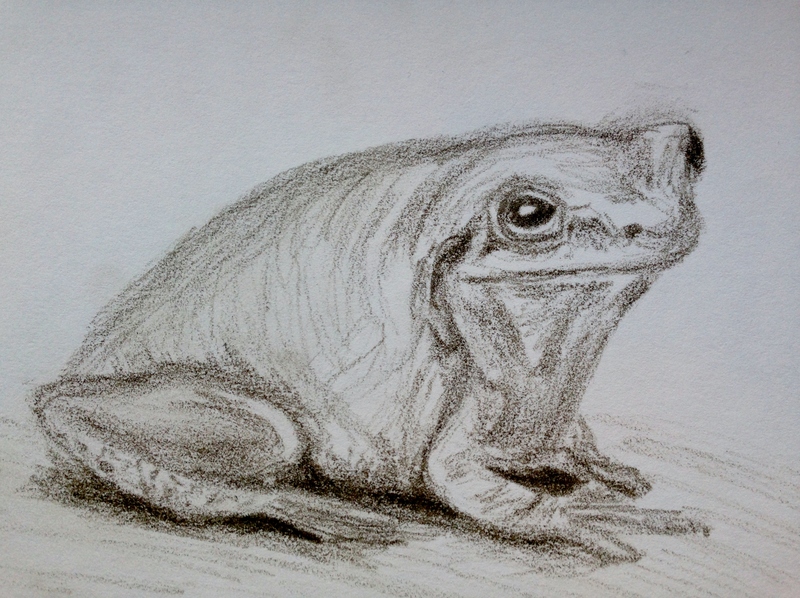 Love the tree frogs at night…..looking forward to those. What a sweet frog. I kind of want him to have a crown and be a prince frog, or would that be a frog prince. There you go with buttery again, yummm! Froggy fabulous, friend! 🙂 WOW, he is so adorable, you did an awesome job, I love it! Thanks so much, or in froggy words, RIPPIT, RIPPIT Laura! Thanks so much, Donna! I was dying to see what you’d think! (I can go back to work now lol) ❤ I am loving your photos, so thank you so much for graciously sharing them with us! Thanks, Rachel! I’m glad. He was fun! Thanks so much, Seagroves! Never too old to say cool! (I’m probably too old too! hehe) So glad you enjoyed this! I love every line even the unerasable! A pencil can offer real punch when needed. Thanks for posting Laura. Thanks, Charlie. hehe. Frogs are so sweet! I should draw them more often. 🙂 Glad you enjoyed! Frogs have such cute faces – yours is great! Thanks, SF! Glad you enjoyed! I too love his expression! Ooh, would be fun to make a froggy stamp, I hope we get to see, Dale! Glad you enjoyed him! Hilariously adorable character! I love frogs! Though I once had quite the carry-on with one hopping around behind my computer desk at 2 in the morning, but I feel that’s another story for another time! Your sketch is marvellous, the glint in the eye is perfect. Great sketch….I might see what happens if I kiss him! Such a cute frog, love the eyes, they lend to its charm and personality. Beautiful portrait. I can definitely hear the little guy! Wonderful drawing of this special critter. Thanks, Mary! 🙂 He was fun! I should do frogs more often. Wonderful image Laura, very realistic, I can see a certain D Trump if I look hard enough, not to detract from your art!! !